Maysville, Kentucky — It was another frigid morning under the clear, pitiless skies of the Cincinnati region, but Luke Kosowatz (’17) was in good spirits. 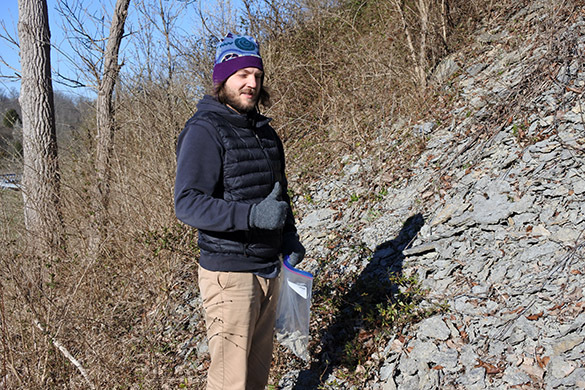 He is collecting at our first stop of the day: an exposure of the Bellevue Formation (Upper Ordovician, Katian) along the Bullitsville Road in northern Kentucky (N 39.08121°, W 84.79230°; C/W-152). 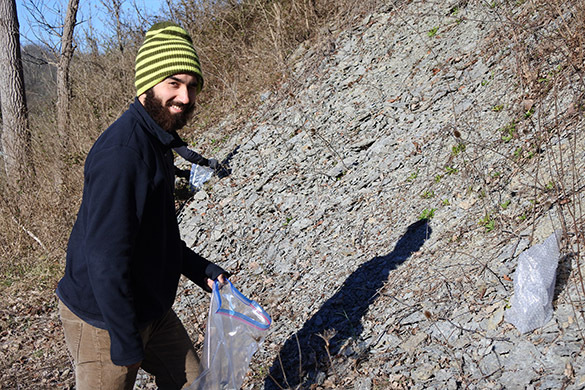 Luke is sorting out bioeroded bryozoans and brachiopods here. Matt Shearer (’18) joins Luke on the outcrop. If the place looks familiar it’s because William Harrison (’15) and I were here almost exactly three years ago. 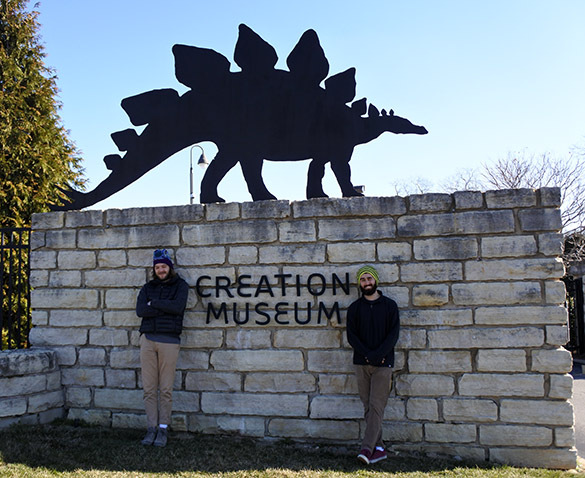 In cosmic irony, the Bullitsville outcrop is nearly a neighbor of the Creation Museum. It was closed this Sunday morning — who would have guessed? Do Creationists ponder the fact that their pseudoscientific establishment sits on an incredible record of fossils 450 million years old? They do indeed: “These conditions and processes would be expected during the global catastrophic Flood described in the Scriptures. The thin alternating coarse-grained limestone and fine-grained shale layers could be deposited quickly under such catastrophic conditions.” Of course. 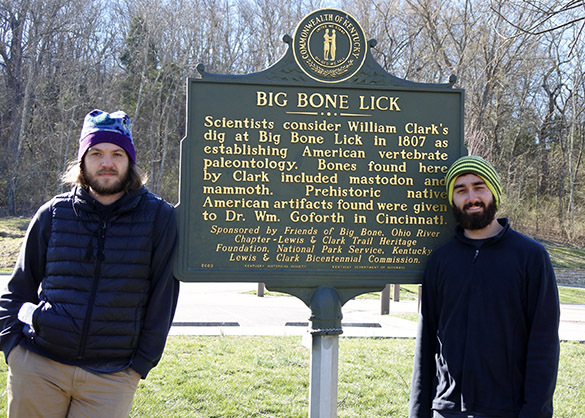 We were also near Big Bone Lick State Park, the birthplace of American vertebrate paleontology. 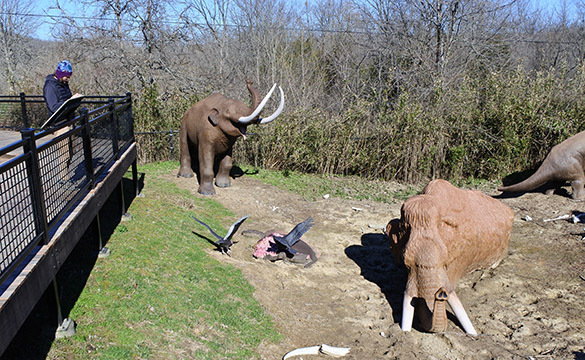 This site has an excellent life-sized diorama of Late Pleistocene animals (mammoths, mastodons, bison, ground sloths and even vultures) getting mired in bogs infused with salty water. Team Cincinnati then traveled east for about an hour to the magnificent exposures of the Cincinnatian Group around Maysville, Kentucky. Here we targeted the Corryville Formation exposed along the AA Highway (N 38.60750°, W 83.76775°). As with all our sites, the fossils are extraordinary. 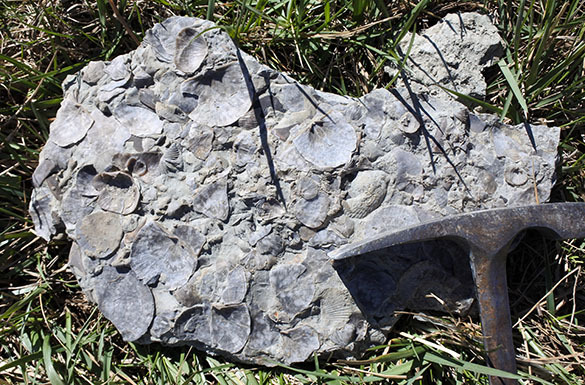 This is an ordinary slab of limestone from the Corryville with dozens of well-preserved strophomenid brachiopods. 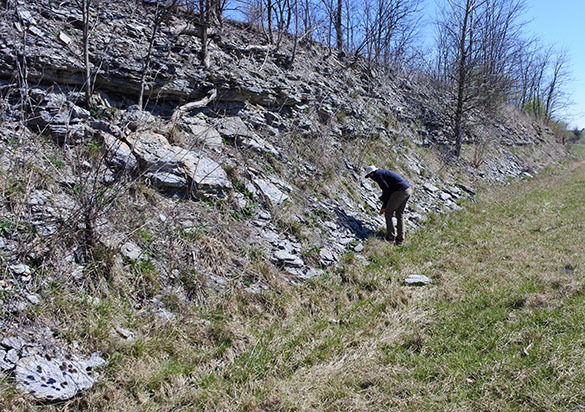 For nostalgia on my part, we visited an outcrop along US 62 at the southern edge of Maysville where the Corryville Formation is again exposed (N 38.60932°, W 83.81070°). It is at this site that I collected a cave-dwelling bryozoan fauna now the subject of a manuscript Caroline Buttler (National Museum Wales) and I are finishing up this month. The cave interval was destroyed by later roadwork, but the remaining outcrops were superb for our purposes. 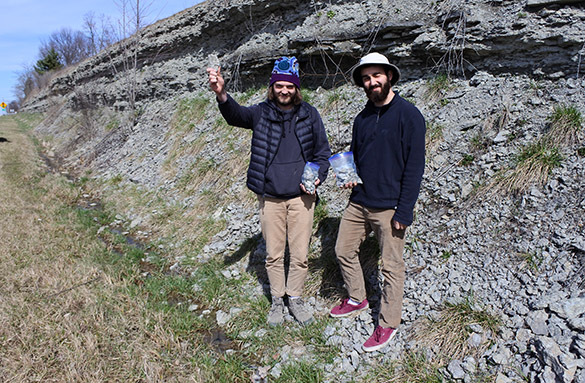 We ended the field day about seven kilometers north at another outcrop of the Corryville along US 62 (N 38.6445°, W 83.77678°). I was so distracted by the diversity of fossils that I forgot to take pictures! Dinner was at El Caminante Mexican Restaurant in Maysville. It was so good we are compelled to recommend it to future geological visitors.